The Center Ithaca Building has 62 modern apartments, is centrally located in the heart of downtown Ithaca, and is on the bus line to both Cornell and Ithaca College. It is an award-winning post-modern design, built in 1981. We have an international mix of tenants of all ages. Professional Office space is available on the Center�s second level. Many offices overlook the retail and dining areas. Convenient parking and easy access to shops and restaurants make Center Ithaca the ideal office location. 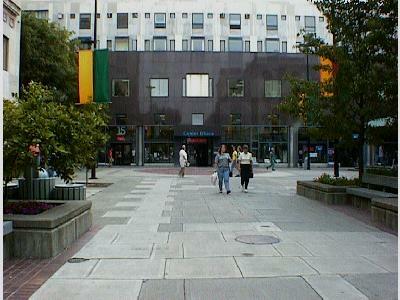 Center Ithaca is located on one of the nation�s most successful pedestrian malls. A rich variety of modern stores and specialty shops, theaters and fitness center create a special shopping experience. 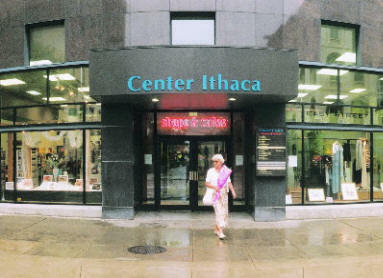 Center Ithaca offers retailers a unique opportunity in a growing market. The Atrium Cafes in Center Ithaca has a three-story skylight open-air seating area. This food court features ethnic and contemporary menus as well as seasonal musical and cultural events. Sizes Range from locker units (4'x3.5'x3') to rooms up to 400 Sq Ft. Modern, Secure, Fire Protection. Located inside the lower level of Center Ithaca, Lease monthly or long term. Easy parking and elevator access.